The Hotel Otter and its old-established Wüste Bar is a stylish place for the young and the young-at-heart in Zürich's Old Town, about 300 metres from the Zürich-Stadelhofen train station and the lake. Surrounded by a wide choice of restaurants, bars, boutiques and international galleries, the Otter hotel is also a very convenient place to stay. The modern rooms have all been styled by local artists and have shared bathroom facilities (3 rooms share a bathroom on the same floor). Wireless internet hotspots are available in the entire Otter hotel free of charge. 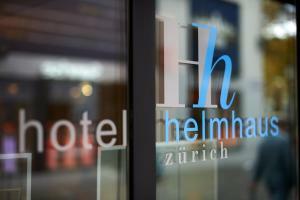 This 3-star hotel is just a 10-minute walk from Zurich Main Train Station. It offers a restaurant and free in-room Wi-Fi. The Bahnhofstrasse shopping street is just a short walk away. At an elevated position on the Zürichberg, but just minutes away from the centre, Hotel Dolder Waldhaus offers panoramic views over Zurich, the lake and the Alps. The Dolder Waldhaus offers rooms and apartments with free Wi-Fi, a balcony, panoramic views and bathrooms with underfloor heating. 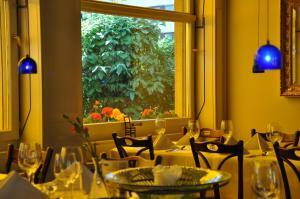 The restaurant features a sun terrace and serves a wide range of Swiss and international specialities. The spa area includes an indoor pool and a sauna, and offers massages. The nearby Dolder Sports offers facilities for many different types of sporting activities. It takes only 10 minutes to reach the historic old town or the main railway station. 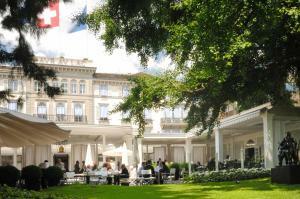 Tourist or cultural attractions such as Zurich Zoo or the Museum of Fine Arts are situated nearby. The financial centre and the famous Bahnhofstrasse are easily reachable on foot. You can find many restaurants, bars and shops in the immediate vicinity of the Alexander Guesthouse. The Hotel Limmathof occupies a historic building 300 metres from Zurich main train station and offers easy access to all points in the entire city, as the "Central" public transport stop is just in front of the hotel. The shopping area, museums, theatres, cinemas and the university are easily reachable on foot. Wireless internet is available in all rooms at the Limmathof hotel free of charge. Zürich Airport is reachable within 35 minutes with the number 10 tram. Centrally located in Niederdorf, the Old Part of Zurich, Hotel Hirschen is a 5-minute walk from the Zurich Main Station and a 2-minute walk from the Rudolf Brun Brücke tram station. It features a roof terrace and a historical arched cave wine cellar with a tavern. The front desk at Hirschen Hotel is at your service 24-hours a day and you can also expect a welcome drink upon arrival. Buffet breakfast is offered and Swiss tapas with cheese and dry meat are served in the bar. Free WiFi is available in public areas. The rooms with romantic-style furnishings feature a TV. The en-suite bathroom comes with a shower. Public parking is available at the Urania Parking House a 5-minute walk from the hotel. Shops and cafes are reachable in the direct surroundings within 5 minutes. Zurich Airport is 10 km away and can be reached by public transport within 15 minutes. The Sorell Hotel Rigiblick is located high above Zurich's skyline, offering spectacular panoramic views of the city, Lake Zurich and the Alps. The Sorell Hotel Rigiblick is well connected by public transport. The journey to Zurich's city centre and to the main train station by the Rigibahn railway or the tram takes only a few minutes. The hotel's At Spice fine dining restaurant, awarded 16 Gault Millau points and 1 Michelin Star, and the cosy Bistro Quadrino offer you culinary delights of the highest quality. The staff of the Rigiblick Hotel will be pleased to stock your refrigerator with whatever you like to have for breakfast. If you travel by car, convenient parking is available in the hotels underground garage. Renowned for warm hospitality for over 650 years, the Hotel Storchen enjoys a unique position in the heart of Zurich, directly at the Limmat River. The rooms and suites offer unique views of the river and of the picturesque Old Town. They combine classic furnishings with warm colours and modern facilities and feature high-speed wired and wireless internet access and air-conditioning. Swiss buffet breakfast can be enjoyed in the restaurant Rôtisserie or, during the summer months, on the beautiful terrace overlooking the River Limmat and the Grossmünster Church. The Storchen bar features live piano music and guests can also enjoy the trendy Barchetta bar, the Boulevard Cafe and the elegant hotel lobby. The concierge team, all members of "Clefs d'Or International" are available 24-hours. Not only is the Storchen the only hotel with its own boat pier, but most of the cultural attractions are within walking distance. Zurich International Airport is only 15 km or a 20 - 30 minute drive away. 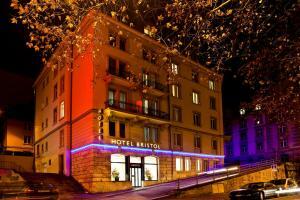 Set in a neo-classicist building, Hotel Bristol enjoys a quiet location in the centre of Zürich, about 5 minutes' walk from the main train station and the ETH Zürich university. All rooms offer free Wi-Fi.They come with flat-screen TV and private bathrooms with a hairdryer. 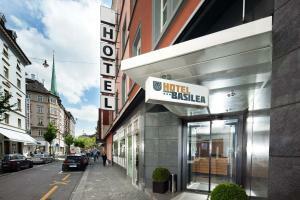 Basilea Swiss Quality Hotel offers a rich breakfast buffet each morning. Guests can use a computer and an Internet terminal as well as a printer free of charge in the lobby. The reception is open 24 hours. Set in the trendy Langstrasse Quarter of Zurich and 30 metres from the bus stop, Dakini's Bed & Breakfast offers individually decorated rooms with cable TV and free WiFi. Breakfast is served every morning and guests can also use the common kitchen of the house. An Italian restaurant is located in the same building. Dakini's features laundry facilities and indoor parking for a surcharge. The Zürich Bäckeranlage Bus Stop is 30 metres away and Zürich Main Train Station is 1.4 km away. Each room is individually furnished in English country-house style, yet offering all modern amenities, such as free high-speed internet access, personal voice mail and telephone calls at no surcharge. 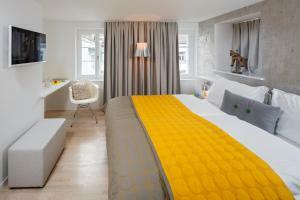 Use of the minibar in each room is included in the room rate and comfort rooms include Hästens beds. There are regular direct train connections from the airport to train station Zürich (takes about 12 minutes). At the train station walk towards station "Bahnhofbrücke". Take the tram number 4 towards Tiefenbrunnen for 8 stops. Exit at "Feldeggstraße". Walk back and take the first left turn onto Mainaustraße. The hotel is located on the left side (number 24). Taxi trip from the airport to the hotel takes about 25 minutes. - Drive towards Bellevue fahren onto Bellerivestraße along the lake. - Pass the opera house and turn left onto Kreuzstraße. - Take the first right turn onto Dufourstrasse that leads to Mainaustraße (4th street on the right). The hotel is located there. 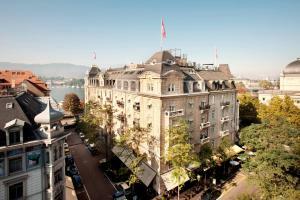 New-opening in September 2014, Hotel Kronenhof in Zürich offers newly renovated rooms as well as a restaurant and a bistro. Free WiFi is available throughout the building. Each room at the Kronenhof comes with a safe, a modern TV, and a private bathroom with hairdryer. A free bottle of still water is provided. Swiss specialities can be enjoyed at the on-site Krone Restaurant, while snacks and cocktails are offered at the Chrönli Bistro. The rich breakfast is also served there. The Zehntenhausplatz Bus Stop (lines 32, 61 and 62) is right outside, and the Zürich-Affoltern Train Station is a 2-minute walk away. Garage parking is offered at the hotel. Just a 3-minute walk from the Oerlikon Train Station and a 10-minute walk from the Messe Zürich fairgrounds, Hotel Löwen offers you tastefully furnished rooms with private bathroom, free WiFi and a charming bar, where also Thai food is served. The centre of Zurich can be easily reached by public transport within 15 minutes from Hotel Löwen. Free parking is available between 20:00 and 08:00 on the street. Just off the Langstrasse nightlife area, Guesthouse Brauerstrasse enjoys a quiet location in the trendy and creative Kreis 4 quarter, a 15-minute walk from Zürich Main Station. Free Wi-Fi is available. Each room is equipped with a flat-screen satellite TV with almost 300 channels and a refrigerator. They also have a private bathroom. Situated in a cross street of the lively Langstrasse, guests can find many stores, clubs and restaurants in the vicinity of the Guesthouse Brauerstrasse. Helvetia Square is only a 5-minute walk away. Situated in Zürich-Seebach, a 10-minute drive from Kloten Airport and Zürich's fairs and exhibition halls, Hotel Landhus offers non-smoking rooms with cable TV, free Wi-Fi, free parking, a bowling alley and a restaurant with an inviting summer terrace. Buses and trams stop next to the hotel. Hotel Landhus' restaurant serves Mediterranean cuisine and seasonal meals and beverages. Guests can enjoy the rich breakfast every morning. Hotel Landhus is 10 tram stops away from the city centre. The Seebach Bus Stop is right outside the hotel. A public outdoor pool can be reached on foot in 3 minutes. The Zürich-Seebach Train Station of the S6 line is a 5-minute walk away. Situated in quiet, green surroundings at the foot of the Uetliberg Mountain, the guests' house is easily reachable from the Zürich Main Station within 10 minutes by the S10 train line. It offers you free parking, a buffet breakfast and rooms with nice views and free tea/coffee-making facilities. All rooms have a TV with video-on-demand, free WiFi, a refrigerator and a bathroom with hairdryer. 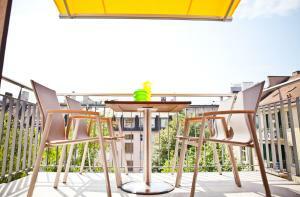 You can enjoy views of the green-hilly surroundings or over the city of Zürich. There is also drinks vending machine and you can make free use of the business corner with an internet workstation and a printer at the guests' house. - Take the S16 train to Stadelhofen Station (500 metres from the Hotel Seegarten). 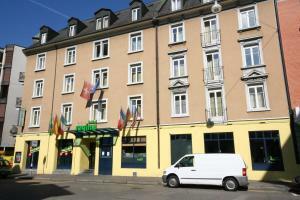 - Get off at the Kreuzstrasse stop (100 metres from the hotel). - There is a rapid transit train service every few minutes bringing you to Stadelhofen Station. - Proceed as indicated above. 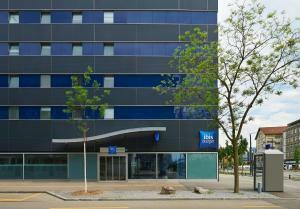 Ibis Budget Zurich City West is located in the trendy Zurich West district, 10 minutes by public transport from the city centre and Zurich Main Station. 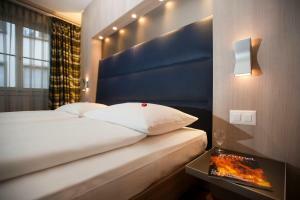 Zurich Airport is 9 km from the Zurich City West Ibis Budget. Situated in the middle of the Old Town of Zurich, a 5-minute walk from the train station, the Hotel Alexander offers you a 24-hour reception, air-conditioned rooms and free Wi-Fi. The financial centre, the famous Bahnhofstrasse shopping area, the ETH Zurich (university) and the car-free lake and river promenade can be reached on foot within a few minutes. You can find many restaurants, bars and shops in the vicinity of the Alexander hotel. The Continental Zürich welcomes you in the very heart of the city, 500 metres from the Central Train Station and the Old Town, and a 15-minute drive from the airport. 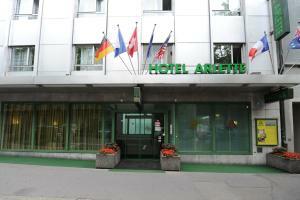 A self-service business centre is at your disposal at the Hotel Continental Zurich as well. The Albisriederplatz Bus and Tram Stop is 50 metres away. Zurich Airport is easily reachable by public transport from the hotel. 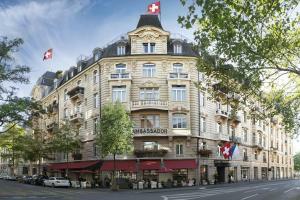 The small 5-star Alden Luxury Suite Hotel Zurich enjoys a quiet location right in the centre. All rooms feature an entertainment system with a flat-screen TV, a hot tub, and gym equipment on request. All rates include a welcome drink, free soft drinks from the minibar, your favourite newspaper, and bathroom amenities. 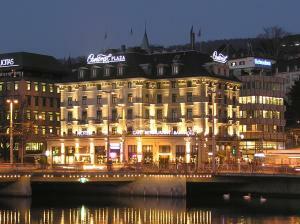 Dating from 1883, the Central Plaza Hotel is situated right at Zurich's Central Square next to the main railway station. Free WiFi and free gym access are available. The Plaza houses a grill restaurant and a piano bar with live music, as well as the King's Cave Restaurant, which is located in the cellar of the building and has a unique ambience with an open fireplace, ancient mirrors and paintings. Buffet breakfast is also offered at the Central Plaza. In the summertime, guests can enjoy dining on the outdoor terrace. All rooms are soundproofed and they come with a minibar, a Nespresso Coffee Machine for free use and satellite TV as well as pay TV. The private bathrooms feature a hairdryer, toiletries and slippers available on request. Opened in September 2013, the self-check-in Hotel Oerlikon Inn is located just a 5-minute walk from the Oerlikon Train Station, providing quick and easy access to the centre of Zürich and to Zürich Airport. Each of the modern rooms at the Oerlikon Inn hotel have a media hub, a tea and espresso machine and free WiFi. Check-in is done at the machine at the entrance door to the hotel. You can also find numerous restaurants and pubs in the surroundings. Within a 5-minute train ride you can reach the Zürich Main Train Station and Zürich Airport. The Messe Zürich fairgrounds and the Hallenstadion can be reached on foot in 5 minutes. As there is no reception at Hotel Oerlikon Inn, a check-in machine is available. The elegant Zürich Marriott Hotel is situated in the heart of the city, only a 5-minute walk from the business and shopping districts, and the sights of the Old Town. Free WiFi is available in all public areas of the hotel. Guests can enjoy premium bedding, free coffee and tea making facilities, international plug sockets and wireless connectivity for up to 6 devices in the innovative superior rooms, executive rooms and suites. All rooms were renovated in winter 2014/2015. The Executive Lounge features comfortable sofas. Snacks and drinks are available for free day and night. Work desks with high-speed internet connection, printers, scanners and photocopy machines are available 24 hours a day. A Swiss and a Thai restaurant provide culinary pleasures at the Marriott Zürich. There is also a bar. Breakfast is served until 11:00. 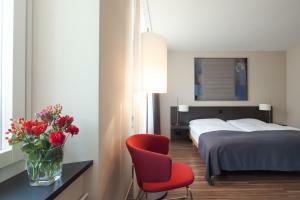 The Holiday Inn Zürich Messe is located between the airport and the city centre, next to the famous Hallenstadion concert venue, the fairgrounds, the Convention Centre and the Theater 11 music hall. Public transportation is conveniently available in front of the hotel, with a direct tram taking you to the city centre in only 17 minutes and another one taking you to the airport in only 15 minutes. The air-conditioned rooms offer free high-speed internet access, wireless internet, tea and coffee making facilities, flat screen TVs and a large work desk with an ergonomic easy chair. Enjoy the modern ambience of the Bits & Bites brasserie or the sunny outdoor terrace and treat yourself to your favourite drink or have a small snack in the bar. 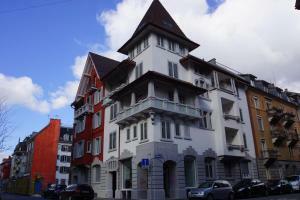 Guesthouse Dienerstrasse is a 15-minute walk from Zurich's Main Train Station and a 5-minute walk from Helvetia Square. It offers free Wi-Fi in the entire property, as well as rooms and apartments with a flat-screen satellite TV with 300 channels. Each accommodation unit comprises a private bathroom, provided with a hairdryer and toiletries. Some apartments at Dienerstrasse Guesthouse additionally contain a kitchen with a dishwasher and fridge. Some of them feature a balcony. 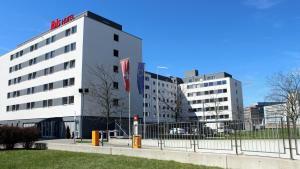 The Hotel Ibis Zurich Adliswil is located next to the Wollishofen exit of the A3 motorway, 5 km from Zürich's centre. It offers free parking and free Wi-Fi in the entire building. 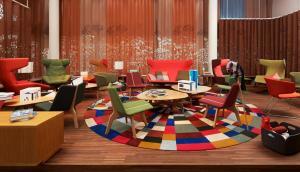 All rooms in the Ibis Zürich-Adliswil feature a satellite TV and a work desk. There is a stylish restaurant with a terrace and a bar, where snacks are available 24 hours a day. The Oerlikon fairgrounds are 12 km away. A bus stop can be found only 100 metres from the hotel. Located in the heart of Zurich‘s historical centre, Wellenberg Swiss Quality Hotel is just a 5-minute walk away from the famous Bahnhofstrasse Shopping Street. It features free WiFi, a fine restaurant, a bar and a 24-hour reception. A rich buffet breakfast is available. The à-la-carte restaurant at Wellenberg Swiss Quality Hotel offers Mediterranean cuisine, while the bar provides a wide selection of wines, cocktails and fine snacks. Guests can also find a lobby a library on site, with a view over the old town of Zurich. A business centre and a summer terrace with a fountain are also at guests' disposal. Zürich City Hall can be reached within 250 metres, while the Lake of Zürich is set 800 metres away. The Zürich Opera House is situated 1 km from the property. The rooms feature natural materials such as walnut wood, leather and granite. All rooms are equipped with a multimedia entertainment system, ISDN and wireless internet access and with the unique Sheraton Sweet SleeperSM Bed. Tea and coffee facilities are available on request. Modern interpretations of traditional Swiss dishes can be enjoyed in the Le Jardin Suisse restaurant. The Le Pavilion meeting room for up to 30 people is available for business travellers in the Sheraton Neues Schloss Hotel. Hotel Greulich welcomes its guests in a strikingly modern building with a straight interior design yet offering a warm and elegant atmosphere. Seasonal and fresh cuisine with a Mediterranean touch is served at the Greulich restaurant. Guests can choose from a variety of small meals and mix and match at their desire. Mainly local ingredients are used. The vegetarian menu is rich and diverse. After a fine dinner the cigar lounge is an ideal place to end the day in style before your bright and airy room welcomes you for a peaceful night' rest. Livingdowntown Premium Apartments in Zürich provide modern accommodation units with free WiFi and a fully equipped kitchen with dishwasher. The Langstrasse Nightlife Area is a 5-minute walk away. The apartments of Livingdowntown Premium also feature a living room, a flat-screen TV, a Nespresso Coffee Machine and a washing machine. 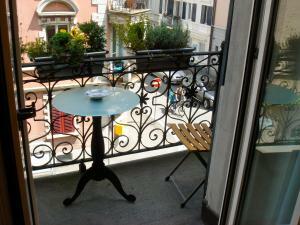 Guests have access to the rooftop terrace and most apartments come with a balcony. Various restaurants can be found in the vicinity and the closest supermarket is 300 metres away. The Kalkbreite Tram and Bus Stop is 250 metres away and the public transports reach the Main Train Station, Lake Zurich and the Bahnhofstrasse Shopping Street within 15 minutes. Parking is possible for a surcharge at a car park, a 5-minute walk away. - Check for trains going to "Zürich Hauptbahnhof". They run approx. every 10 minutes and the ride takes about 12 minutes. - The hotel faces the main train station. Each room provides controlled cooling and features an individual style and design, including carefully selected antiquities. The modern facilities include a flat-screen satellite TV with MP3 connection, a trouser press, and a bathroom with hairdryer. Situated in the district of Zurich-West and offering private underground parking and easy connection by public transport, Ramada Hotel Zurich City is directly opposite the Letzigrund Stadium. Guests can unwind in a lobby bar offering cocktails, a selection of wine and tapas. The multifunctional rooms feature free WiFi, a free bottle of water, a flat-screen satellite TV and a hairdryer. The Ramada Zurich features a gym at your disposal. Guests can reach Zurich's Main Train Station within 15 minutes with the tram number 2 and then switch to tram number 14. Apart from the main stock exchange centre and banking headquarters, Zurich's attractions vary from museums to a rich night life. This 5-star boutique hotel enjoys a unique location in the Mobimo Tower in the trendy Zurich-West district. Many corporate offices and a popular nightlife area are nearby. The elegant, air-conditioned rooms at the Renaissance Tower Hotel offer parquet floors and large windows for panoramic views. Other features include flat-screen TVs, iPod docking stations, and free tea and coffee-making facilities. 24-hour room service is available. The Executive Lounge on the 14th floor offer unique views over Zurich. Access is included in some room rates. The Executive Lounge features comfortable sofas and offers snacks and drinks for free day and night, work desks with high-speed internet connection, printers, scanners and photocopy machines 24 hours a day. The Renaissance Zurich Tower Hotel also features a sauna, a steam bath, and a solarium. A wide range of international dishes and wines, as well as fine steaks, is served in the Steakhouse. Guests can relax on the summer terrace. Drinks and snacks are available in the Coffee Shop and in the lobby bar. The Hardbrücke Train Station is 500 metres away, and the Technopark Bus Stop is just 100 metres from the hotel. 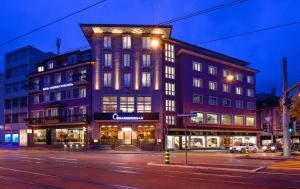 Hotel Scheuble is set in the heart of Zurich, just a few steps away from the main train station. Zurich Airport can be reached in 15 minutes. At Restaurant Tagliatelle guests can enjoy a variety of freshly prepared pasta dishes and a range of seasonal specialities. Public parking is available on request close by, where 10 places are reserved for Hotel Scheuble. Guests enjoy discounted rates. The Hotel Olympia Zürich is located in a residential area, just a 10-minute drive or tram ride, or a 30-minute walk away from the Old Town. All rooms have a flat-screen cable TV and a private bathroom. Every morning you can enjoy a rich buffet breakfast including Prosecco and smoked salmon and in the evening you can sip your favourite drink in the bar of the Olympia Hotel Zürich. WiFi internet access is available in all rooms of the Olympia Hotel Zürich at an additional cost. Plenty of parking spaces are available around the hotel and garage parking is possible as well. The reception is open 24 hours a day. Enjoying a privileged location in natural surroundings above Zurich, next to the cog railway station, The Dolder Grand offers a 4,000 m² spa, 2 award-winning restaurants, and free Wi-Fi access. All rooms have a flat-screen satellite TV and are equipped with bathrobes and slippers. 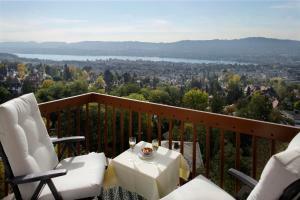 They offer views over Zurich, Lake Zurich, the Alps, or the nearby forest. The Dolder Grand Spa includes a large pool with panoramic views, a ladies’ and gentlemen’s spa, fitness facilities, 18 treatment rooms and 2 Spa Suites. In the 13 GaultMillau points awarded Garden Restaurant and in The Bar, guests can enjoy modern cuisine and a wide selection of fine wines and drinks. Innovative gourmet dishes are served in The Restaurant, which has been awarded 18 GaultMillau points and 2 Michelin stars. Guests can also take advantage of a free shuttle service to the city centre. A limousine service is available upon request. The Bahnhofstrasse shopping street and Zurich Main Train Station are quickly reachable by tram. Direct airport connections are available from Enge Train Station. 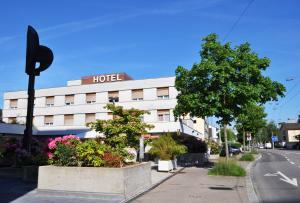 Only 100 metres away from the Technopark business centre and a 10-minute drive from the main train station, this modern hotel is located in a trendy part of town close to the motorway. The Ibis Zürich City-West offers comfortable, air-conditioned rooms, a 24-hour bar, a terrace, and an underground car park (at an additional cost). The Swiss Bistro serves traditional Swiss cuisine in the ambience of a mountain chalet. The airport is 9 km away from the Ibis Zürich City-West. All the city's sights can be reached quickly and easily. - Take tram no 4 direction Tiefenbrunn to the Kreuzstraße stop. - 2 minutes' walk down to the lake. Every 10 to 15 minutes there are S-Bahn trains leaving from the airport for the main station or directly going to the Stadelhofen stop. - At the main station change to another S-Bahn to Stadelhofen. - Tram no. 4 from the main station to the Kreuzstrasse stop. The Leonardo Boutique Hotel Rigihof Zurich was built in Bauhaus style and features impressive murals. Each room is dedicated to a famous inhabitant of Zürich, like Thomas Mann, Albert Einstein, Max Frisch and others. Savour delicious Swiss and international cuisine in the newly styled restaurant or on the terrace and unwind in the inviting lounge bar. At the reception, a mini-market is available 24 hours a day. Direct tram lines bring you to the airport, the main train station, to Lake Zurich, to the fairgrounds and to the theatres and the opera from the Leonardo Boutique Hotel Zurich. Each apartment also comes with a flat-screen cable TV, a sofa, a washing machine, a fully equipped kitchen and a Nespresso Coffee Machine. The bathroom is fitted with a shower or bath tub and hairdryer. A cafe is just beside the Luxury Apartments by Livingdowntown and a restaurant can be found 100 metres away. A supermarket is 500 metres away. The public transports reach the Main Train Station, Lake Zurich and the Bahnhofstrasse Shopping Street within 15 minutes. All rooms have individually controlled air conditioning and soundproof windows. They feature modern furniture and hardwood floors, and come with a flat-screen TV with 40 international channels. Bathrobes and tea-making facilities are available upon request. Situated in the trendy and modern district of Zürich West, the Hotel Senator offers easy access to the centre from nearby (100 metres) bus and tram stops. The famous Bahnhofstrasse and the Old Town are only 7 minutes away by tram lines 4 and 13 from the Senator hotel. The restaurant, the beautiful garden terrace and the hotel bar invite you to enjoy a wide range of typical Swiss and international specialities, as well as aperitifs and drinks. A rich buffet breakfast, as well as hot and cold meals for lunch and dinner are offered. 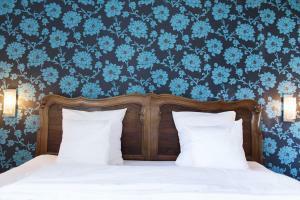 Tastefully furnished rooms invite you to relax after a day of doing business or sightseeing in Zürich. Zurich West is a very popular area of the city centre, featuring many trendy bars, restaurants, cinemas and the most famous clubs and discos of the city. - Take tram 6, 7, or 13. - Get off at the first stop after Paradeplatz, called Stockerstrasse. - Take tram line 11 and get off at Börsenstrasse. Stockerstrasse Tram Stop is just 100 metres away, while the Main Train Station is 1 km from the hotel. Zurich International Airport is at a distance of 10 km. 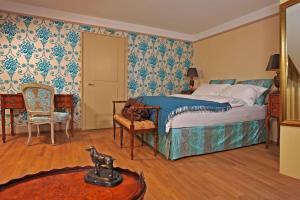 The rooms, individually decorated in bright colours, come with air conditioning and private bathroom with shower. They are fitted with an iHome sound system for iPod. Guests can use the top-floor sauna free of charge. Bicycles and a Mini Cooper can be used free of charge depending on availability. The Toni- Areal Tram Stop is situated in front of the 25hours Hotel. The Hotel Adler is located in the Old Town of Zurich, right in the city centre..
From the Main Train Station (Hauptbahnhof) take tram no. 4 in the direction of Seefeld and exit at Rudolf Brun Brücke. By car you are able to drive to the Hotel and unload your luggage. Pass the Zährungerplatz and follow the hotel signs through Brunngasse to Hirschenplatz. Take the train to the main station. From the main station, cross the river to the central place, and then behind the Limmatquai (Starbucks), you will arrive at the Zähringerstrasse. 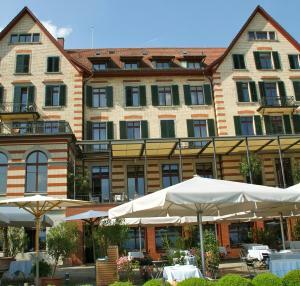 After 40 metres you will see the Hotel Zürcherhof. Hotel Regina is centrally located in Zurich’s fourth district, right in the centre of the city’s night life area, and offers a restaurant and a garden with fountain in the courtyard. The hotel bar is a popular meeting place for guests and locals alike. All rooms at the Regina hotel are equipped with cable TV, a telephone, a minibar, and a private bathroom with shower. Guests can reach the centre and the lake by tram within 10 minutes (line 8 from Helvetiaplatz). - Take trams 6, 7, 11 or 13 to the Rennweg stop or walk 7 minutes to the hotel. - Take any train to Zürich Main Station. From the airport you can take the shuttle bus (every 30 minutes) or a train to the main station (every 15 minutes). Take trams 4 or 15 to Helmhaus. From there it is a 1-minute walk. All rooms feature elegant, modern furniture, a flat-screen satellite TV, a safe, a direct-dial telephone with voice mail, and a bathroom. The restaurant serves a hearty breakfast buffet. The Hotel Montana also features an underground car park and a 24-hour reception. The centre of Zurich and the Bahnhofstrasse shopping street are only a 10-minute walk away. All sights and attractions of Zurich can be easily reached on foot or by public transport. Situated in a car-free nature reserve on the Uetliberg Mountain above Zurich, Im Sonnenbühl features a lush garden with a pool, barbecue facilities, a pond and a terrace. The closest train station is a 3-minute walk away and Zurich’s centre can be reached within 20 minutes by public transport with the S10 train. Most units at the Sonnenbühl come with a private kitchen and all feature a private shower. Some units come with a flat-screen TV and a sofa. Guests can enjoy panoramic mountain views at the property. Yoga classes and massages are provided upon request and guests can enjoy mountain biking and hiking in the surrounding area. A hammock ensures the guests’ relaxation. A bar and restaurants are within a 5-minute walk of Im Sonnenbühl. A supermarket can be reached within 5 minutes by car. Built in 1909, The Eden au Lac has been playing host to an international clientèle for already a century. 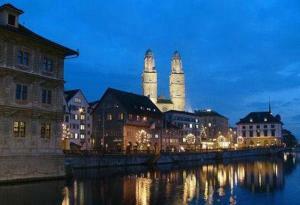 It enjoys a scenic location on Zurich's elegant Utoquai, and offers rooftop Sky Bar opened all year. The hotel is a listed historic building housing individually designed rooms and suites with all the comfort expected of a luxury Swiss hotel yet still reflecting the old-world charm. Most rooms include an attractive balcony or terrace with fine views of Lake Zurich, the city and the distant snow-capped Alps. Business guests are offered modern technical facilities. Guests can enjoy fine dining in the Restaurant Eden offering modern cuisine and selection of European wines. Half board can be requested in advance. When it comes to cocktails and aperitifs, the Eden Lobby Bar is particularly popular among music lovers and is also serves as a casual second restaurant, offer all-day dining options. A regular attraction from October to May is the weekly “Jazz in the Bar” session every Thursday evening, a highlight on the city’s music and social scene. The Eden au Lac hotel takes pride in providing a highly professional but personalised service. - Take tram lines 11 or 14 to Kronenstrasse. - The tram stop is directly in front of the hotel. - Frequent train services will take you to Zurich's main railway station within 15 minutes. - City shuttle buses are available at the airport and will bring you directly to the hotel. Parking is available 20 metres from the hotel. Only 2 tram stops or a 5-minute walk from Zurich Main Train Station and the Bahnhofstrasse shopping area, the Comfort Hotel Royal Zurich offers a private garage parking for a charge, and free WiFi in all rooms and public areas. The air-conditioned rooms provide a minibar, a flat-screen satellite TV with programmes in 12 languages, and an en-suite bathroom. Wired internet is available for a charge. Free coffee, tea and international newspapers are provided in the lobby. A breakfast buffet including sparkling wine is served daily from 06:15 to 10:30. An Italian restaurant is right next door. 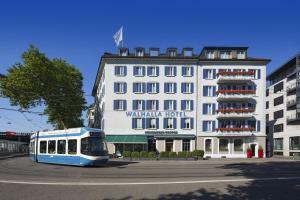 The Haldenegg Tram Stop (lines 6 and 10) is just in front of Comfort Royal Hotel Zurich. A shuttle bus goes to and from the airport every 30 minutes. Uniquely situated in its own private park in the heart of Zurich with views over Lake Zurich and the Alps, the 5-star Baur au Lac offers elegant and luxurious rooms and suites with free minibar use. Guests benefit from an award-winning restaurant, free WiFi, and a top-floor fitness centre. 2 renowned restaurants, one with a terrace in the idyllic garden, an inviting bar, as well as a members-only night club, contribute to the fame of the Baur au Lac. The Restaurant Pavillon was awarded 1 Michelin star and 17 points by Gault Millau. Valet parking, a limousine service, maid service twice a day, and a concierge service around the clock are also offered at the Baur au Lac. You can also have your car repaired and washed in the hotel's garage, buy flowers, or browse through the offer of the wine boutique. The banking centre at the Parade Square and the famous Bahnhofstrasse shopping street are only a few minutes' walk away. 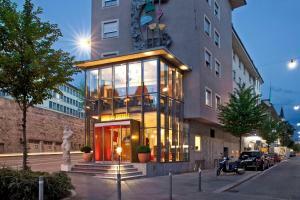 Hotel DaVinci can be found in the Niederdorf quarter next to the Limmat River and next to a famous night club in the centre of Zurich, a 5-minute walk from the Main Train Station. All rooms have a flat-screen TV. A selection of snacks and drinks is available in each room. Bathrooms are private or shared. Breakfast can be arranged at the Café beside the hotel. In the evenings, guests can enjoy drinks and dance at the nightclub Haifischbar, which is next door. The Rudolf-Brun-Brücke Tram Stop is located right next to the DaVinci Hotel. The ETH Zürich University is also just a 5-minute walk away. 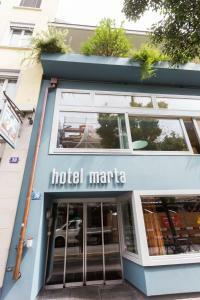 Newly renovated in 2010, the Hotel Marta offers good-value rooms in the centre of Zürich, 5 minutes' walk from Zürich Main Station. Free Wi-Fi is available in the entire building. All rooms in the Marta Hotel have a private bathroom and a flat-screen cable TV. The entire hotel is non-smoking. Situated in the charming Niederdorf quarter, the B&B Hotel Marta is only 50 metres away from the Polybahn cog railway to the ETH Zurich. The famous Bahnhofstrasse and Lake Zurich can be reached within a 10-minute walk. The reception is open 24 hours a day and features a small lounge area with free tea facilties. The property features an elevator. The Opera House as well as Grossmünster Church are both 350 metres away. Zurich Main Train Station is 1.2 km away. - Alight at the Stockerstrasse stop. 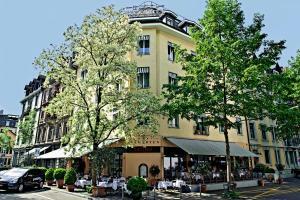 - The Fleming's Hotel Zurich in Brandschenkestrasse is only a few minutes' walk away. - From Bahnhofsplatz (station square) take the S3 city train line towards Albisrieden. - Alight at the Stauffacher stop. - Change to the S2 city train line towards Tiefenbrunnen. - Alight at the Sihlstrasse stop. - Take bus number 66 and alight at the Brandschenkestrasse stop. From the main train station take tram line no. 6 in the direction of the zoo and get off at "Platte". The common living room featuring comfortable couches invites you to relax or to browse through the latest magazines. You can also help yourself to a drink from the honesty bar or make yourself an Italian espresso. The refrigerator is stocked with healthy snacks. For a surcharge, guests can enjoy a small breakfast with croissants, fresh fruit and more at the living room of the hotel, or get a voucher for the breakfast buffet at the neighbouring hotel. The Florhof Hotel is an elegant, aristocratic house from the 18th century, which was family-run for 3 generations, located within walking distance to the historical centre of Zurich. It offers quiet surroundings, a garden terrace and free WiFi. Formerly a merchant's home, today a modern hotel, it features tastefully furnished rooms with parquet flooring and contemporary décor. The rooms all offer views of the garden or the Old Town of Zurich. Fresh delicacies are offered in the hotel's own restaurant, in the new lounge or in the historical vaulted cellar. The exceptional Hotel garden with its historical Neptun Fountain invites guests to relax. The Sky Garden conference room is available for meetings. 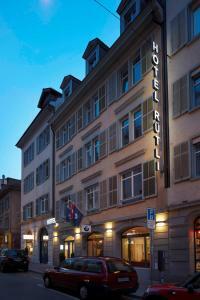 Hotel Florhof is within quick and easy reach of many public transports, just around the corner from the Art Gallery, Theatre and University, not to forget the lively Zurich old town and all its attractions. Built in 1889 and family-run since then, the St. Gotthard was recently refurbished, modernised and enlarged. It offers free Wi-Fi throughout its 5 storeys. The famous Lobster and Oyster Bar was established in 1935. Ever since, it has been a culinary institution serving classic French cuisine. The Lobby Restaurant serves international cuisine and offers live piano music. The Piazzetta has a summer terrace overlooking the Bahnhofstrasse. The Manzoni is a stylish Italian bar. Many shops and restaurants are only steps away. Lake Zurich can be reached in a 10-minute walk from Hotel St. Gotthard. The hotel does not have private parking facilities. Parking facilities are located a 5-minutes walk from the hotel and cannot be reserved in advance. - Get off at the Helmhaus stop. - The next street on your left side is Rössligasse. From the airport take the train to the main station and proceed as indicated above (20 minutes). The air-conditioned rooms feature a flat-screen TV with a keyboard for internet access, tea and coffee making facilities, and a minibar. Guests also enjoy free access to the state-of-the-art health club and indoor pool. The Holmes Place Health Club at the Crowne Plaza offers a wide range of high-end sports and wellness equipment on 2,000 m². The hotel also features 550 parking spaces in its private parking garage. 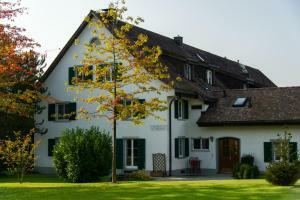 This bed and breakfast is located in Zollikerberg, 15 minutes by car or by public transport from the centre of Zurich. It offers free WiFi and a large garden. The rooms at B&B Zollikerberg feature a seating area, wooden floors, and a refrigerator. Bathrooms are shared. Some rooms have a TV and a refrigerator is available upon request. A rich breakfast buffet with many regional products is served every morning. The Zurich Airport can be reached in 30 minutes, either by car or by public transportation. Zurich Main Train Station can be reached within a 10-minute walk. 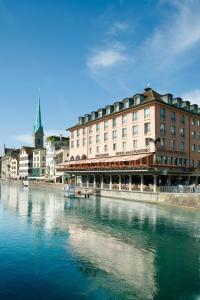 The historic district, shopping centres and the banks of Limmat River are only a few minutes away. Limmatplatz Tram Stop is a few steps away from the guest house. Every room is equipped with cable TV, a work desk, and a hairdryer. Ironing facilities are available on request. All of the non-smoking rooms of the Spirgarten Hotel were renovated in November 2013 and feature stylish modern furniture and parquet flooring. A bottle of mineral water is provided in each room for free. Daily specials are offered from Monday to Friday, and à la carte dishes are served on weekends. A Sunday brunch is offered as well. Guests of the Best Western Hotel Spirgarten have free access to the Altstetten swimming pool, which just a 3-minute walk way. The A3 motorway is just 1 km away. Limited parking is available on site. The Train Station is reachable in 15 minutes on foot or in 5 minutes by the tram no 7. - Take tram number 6 (direction Zoo) or number 10 (direction Oerlikon). - Get off at second stop 'Haldenegg". - It takes 30 minutes until the 'Haldenegg' stop which is just beside the hotel. - Follow the signs for 'Hotelbus'. - The Ben Shuttle service leaves every 30 minutes from 05:30 until 22:00 every day. - The 12-km transfer takes approximately 20 minutes. Swissotel Zurich's convention center provides space for events for up to 1000 people. A bakery, a hairdresser, a cafe and a shoe shop are located in the lobby area of the hotel. Only 15 min. 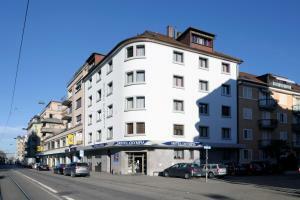 away from Zurich airport by direct train (station Stadelhofen). Or to reach with the airport shuttle. For private car we have a public car parking 200m away from the hotel. The Zurich main station is only 10min. away from the hotel with tram or train (S-Bahn). 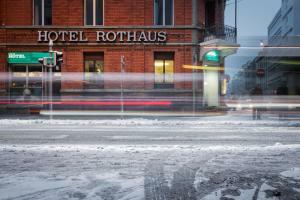 - The hotel Rothaus is just 30 meters from the busstop. On foot it takes about 12 minutes. The Hotel Swiss Night am Kunsthaus is situated in a quiet location in the city centre and offers you cosy rooms with free WiFi and a garden terrace. Each of the spacious rooms is fitted with modern beds and on request, a continental breakfast is served in the morning. All sights and attractions including the Bahnhofstrasse, Lake Zurich, the University Hospital and the banking district are easily reachable on foot. The next public transport stop is only 150 metres away. A jogging path into the woods of Zurichberg is only 2 minutes away from the hotel. Tram 4 and 13, a 2-minute walk from the guest house, takes you to the Old Town and the Lake Front within 15 minutes. The airport can be reached in 12 minutes by train. Bahnhofstrasse, the exclusive, main shopping avenue of Zurich is 500 metres away. 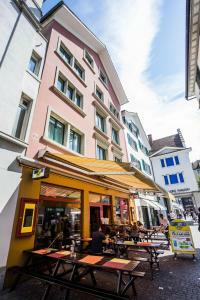 Pension fürDich is located in the centre of Zurich, 15 minutes by bus or tram from the Main Train Station. It includes a bar with a café and a bistro. Free Wi-Fi is available, and bicycles are provided free of charge in summer. The Bäckeranlage Tram Stop is just 100 metres away from fürDich Pension. Newly opened in January 2014, Sheraton Zürich Hotel is located in a lively area of the city, featuring several shops, bars and restaurants. It offers free WiFi throughout the hotel, air conditioning, a fitness centre, a 24-hour front desk and an à-la-carte restaurant. Public parking spaces are available on site. The spacious rooms at the Sheraton Hotel come with a flat-screen TV with cable and pay-per-view channels, an iPod docking station, a seating area, and a coffee machine. They also feature a private bathroom equipped with free toiletries. Zurich Train Station, the Paradeplatz and the Bahnhofsstraße shopping street are all situated a 3-minute drive from the hotel. Lake Zurich can be reached within 5 km and Zurich Airport is 10 km away. Only 200 metres away from Lake Zurich’s promenade and the Opera House, Hotel NI-MO is located in Zurich’s Seefeld district, with its many boutiques, cafés and restaurants. Rooms have free Wi-Fi. Free tea, Nespresso coffee and water are available 24 hours a day in the breakfast room. A cable TV and electronic safe are standard in every room. 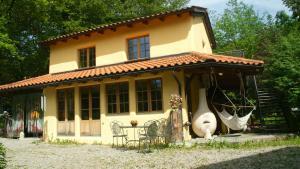 They all have original parquet flooring, functional furniture and contemporary bathrooms. Breakfast is buffet style and includes variety of fresh fruit, assorted Swiss bread and croissants, several kinds of Swiss cheese and dried meat, muesli, cherry tomatoes and yogurt. Hot milk and eggs any style are available on request. 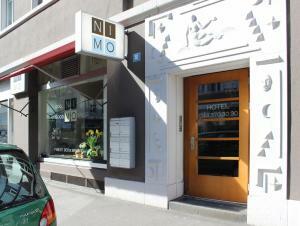 Stadelhofen Station is just 400 metres away from Hotel NI-MO. You can take a tram here and reach Central Station in about 10 minutes. The non-smoking rooms at the Neufeld Hotel are soundproofed and feature a flat-screen TV and a safety deposit box. The private bathrooms were renovated in 2013. Every morning a generous buffet breakfast including Bircher Muesli is provided. The Goldbrunnenplatz bus and tram stop of the trams 14 and 9 is 50 metres away and provides direct connections to the Zürich Main Train Station, to Paradeplatz and to Lake Zurich. A shuttle service from and to the airport is available at an additional cost. 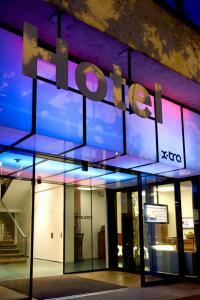 Situated in Zürich's red-light district, the non-smoking Hotel Gregory offers rooms with cable TV. Zürich Main Station is a 10-minute walk away. Rooms here are bright and have wireless internet access, a desk and cable TV. 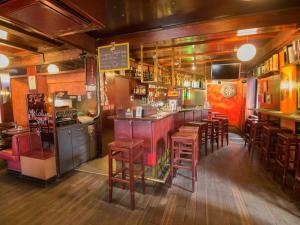 There is an English pub on the ground floor, inviting you to spend relaxing hours after a day out in Zürich. Reception is open 24 hours and the hotel’s private car park is located round the corner in Neufrankengasse. The Gregory is 4 stops away from the main railway station (Bus Route 31), and the bus stop is directly opposite the hotel. In the surroundings you can find many museums, nightclubs and restaurants. Guests can make use of a printer and park their car in the hotel's garage. Bus and tram stops are just 100 metres away. The restaurant offers you contemporary Swiss cuisine with an international touch, combining Haute Cuisine and simple, traditional Swiss recipes. Among the specialities from all around the world you can find Viennese Schnitzel with cucumber salad, Beef Tartar and young salted herring with celery salad. Every Sunday morning you can enjoy an extensive brunch. WiFi is available in all of the stylishly furnished rooms free of charge. Close to the Helvetia Hotel you find the Stauffacher square, which is an important public transport hub, from where all places in Zurich are easily reachable by tram. The Selnau S-Bahn (commuter train) stop is close by as well. 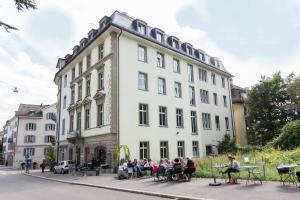 The EMA House Hotel Suites offers you spacious suites in a central location, about 600 metres from Zurich's main train station, the ETH Zürich and the University of Zurich. Free wired and wireless internet is available. All suites feature a work desk, direct dial phones, fax and internet connection, and individually adjustable air conditioning. A washing machine for shared usage is also available. The Old Town and Bahnhofstrasse are only 2 tram stops or a 10-minute walk away and you can get to the airport by taxi within 15 minutes. A direct tram line takes you to the fair and exhibition grounds. You can park your car in the garage of the EMA House. The Zurich-Enge Train Station is just an 8-minute walk away and provides direct connections to the airport. The Hürlimannplatz Bus Stop (line 66) is 200 metres from the hotel, and the Enge/Bederstrasse Tram Stop (line 13) is a 7-minute walk away. Located 3 km from the Lake Zurich and 8 km from Uetliberg, Le Bijou offers a ski storage room, free WiFi and air conditioning. A tram stops 300 metres away. The units feature 1 bedroom, 1 bathroom with a bathtub, a hairdryer and a toilet, a lounge area, a fully equipped kitchen with a dishwasher and a dining area, 2 flat-screen TV’s with cable channels, and air-conditioning, a safety deposit box and alarm protection. Guests at Le Bijou can use the garden equipped with barbecue facilities. There is a luggage storage room. Shuttle services to the Airport or train station and personal assistance are available on request. Concierge services, 24-hour personal assistance, a private chef and catering services can be arranged during the stay. A restaurant is 50 metres away and supermarket is 200 metres away. The train station Zurich Hardbrücke is 1,200 metres away and the Main Station is 3 km away. The Hotel Hottingen is centrally located, 500 metres from the Kunsthaus Zürich museum, next to the Hottingerplatz bus and tram stop. It offers free Wi-Fi and common kitchens on each floor. The Zurich University, the Federal Institute of Technology (ETH) and Lake Zurich can be reached within a 10-minute walk. Direct tram lines go from the Hottingerplatz stop to Zurich Main Station. All rooms in the Hottingen Hotel are equipped with a cable flat-screen TV. Wooden floors and modern decoration round off the new rooms. Most units contain a private bathroom. The SZU S10 leaves from platform 2 every half hour and travels just 21 minutes to Uetliberg, its final station. The last train leaves from Zurich main station at 23.05 Uhr from Monday to Thursday, at 23:35 on Friday and Saturday and at 23:15 on Sunday. The hotel is situated in a traffic-free recreation area close to town. There are several parking opportunities in Zurich but the hotel recommends that you park your car at the Gessnerallee multi-storey car park or at the Feldmoos free parking area in 8142 Uitikon-Waldegg. - Follow signs for Urdorf. - Exit Urdorf Süd (South) toward Birmensdorf and then Zurich. - 200 metres after the traffic lights in Uitikon-Waldegg the car park Feldmoos is situated to your left. Cross the pedestrian bridge, walk up the natural steps to the railway line and proceed approximately 300 metres to the right until you reach the Uitikon-Waldegg train station. 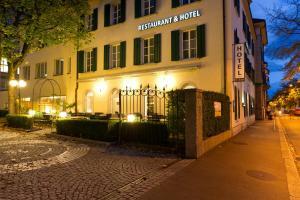 Hotel Villette enjoys a central location close to the Stadelhofen Train Station and Lake Zurich. It features a traditional Swiss Fondue, a Raclette restaurant and a bar. It offers free WiFi in all areas. 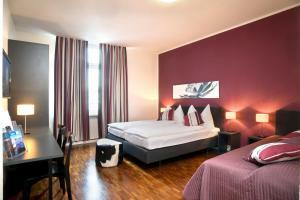 The quiet, simply furnished rooms at Hotel Villette City Center Bellevue feature a TV. The Bellevue Bus and Tram Stop is just a short walk away. Set in a beautiful garden in central Zurich, Hotel Engimatt features a private tennis court and free WiFi access in the rooms. 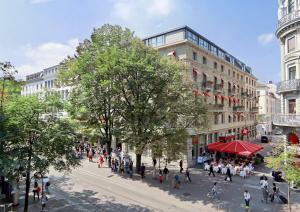 It is a 15-minute walk from the centre, the Bahnhofstrasse street and the Paradeplatz Square. The Engimatt’s spacious and modern rooms feature a balcony, a cable TV with over 100 international channels. Each room also includes a minibar, a Nespresso coffee machine, tea facilities, and a bathroom with hairdryer. The restaurant Orangerie is designed as a winter garden and serves Swiss and international cuisine. In summer, guests can dine in Hotel Engimatt’s garden. The modern Asia Spa is just around the corner and can be used at an additional cost. 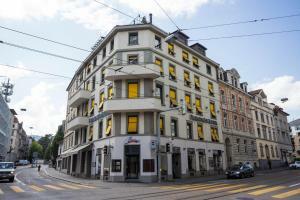 The Engimatt Hotel is a 7-minute tram ride from Zurich Main Train Station (line 13). A large shopping centre is just a 5-minute walk away. A secured parking in the courtyard of the hotel is available against a surcharge and on request. Guests can also buy day tickets for the public parking spaces in Zurich at the reception. For a surcharge, guests can store their luggage in the lockers of the hotel. 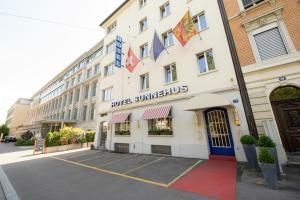 Enjoying a central location in Zurich, the elegant Hotel Sunnehus provides French Flair in the University Quarter of the city and is just 300 metres from the Old Town. Cultural attractions such as the opera, theatres, art galleries and concert halls are nearby. Enjoy the complimentary breakfast buffet either in the breakfast room or in the shady garden of the Sunnehus hotel. WiFi and wired internet is available in all hotel rooms free of charge. There are direct tram lines to the airport, the main railway station and the lake. Only 100 metres from Zurich Main Train Station and the Sihlquai Tram Stop, Hotel Walhalla offers free WiFi throughout the property. The en-suite rooms are equipped with satellite TV, a tablet computer and a safe. A varied breakfast is available every morning. Train connections to the airport leave every 10 to 15 minutes. Within a 5-minute walk there are banks and a shopping centre. A public parking garage (Parkhaus Hauptbahnhof) is a 1-minute walk away from the Walhalla Hotel. Four Points by Sheraton Sihlcity Zürich is located in the Urban Entertainment Center Sihlcity, including a shopping mall, offices and a cinema. A bus, a tram and a train stop right at the building and provide connection to the city centre of Zurich and Lake Zurich. Guests enjoy reduced admission to the exclusive Asia Spa. All rooms of the modern hotel are air-conditioned and feature flat-screen cable TV, high-speed internet connection, a minibar, a safe, coffee and tea making facilities, comfortable beds and ironing facilities. Bathroom facilities include a hairdryer, bathrobes and slippers. A bottle of mineral water and a coffee to go are included. Calls to the Swiss fixed network are free. The Restaurant Rampe Süd offers classic-cosmopolitan cuisine, and the Urbano Bar & Lounge invites to relax. The hotel furthermore offers 8 seminar and conference rooms on 650 m². The hotel is located on the area of a former paper factory and some parts of the building are listed. - Airport shuttle (public shuttle, every half hour). The Zurich main station is only a 10-minutes tram or train (S-Bahn) ride away from the hotel.